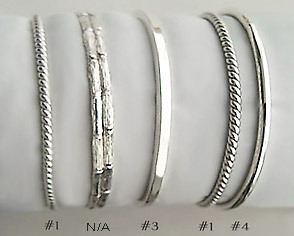 Heavy, handmade, bangle bracelets created in 10 gauge (8 gauge for twisted) sterling silver wire. High polish, but can be made with a matte finish on request. 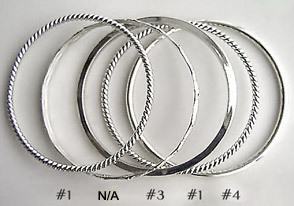 These silver bangles are made heavy so they will not bend out of shape with wear, but light enough to wear 4, 5, 6 or more of them on one wrist. (price based on $1750 gold market / $40.00 silver market. $60 - $70 - $80 ea.